Sailing yachts can perform as good as motoryachts with favorable winds and with the right crew on board of a sailing yachts which is very important to have experienced sailors. Buying a grp ( glass reinforced plastic ) shortly fiber glass yachts has many advantages as well as a widely known disease which is called “osmosis” and you might really want to know if your future yacht has been effected with osmosis which can be disastreous when not cured timely. Sailing yachts for sale by international yacht brokerage specialist based in Turkey, If you want to sell or buy a yacht, let us check it out for you. Boats age, engine hour and generator hour and the maintanence carried out, electrical system wiring, yachts mechanical, hydraulic, electric systems, yachts propulsion systems, shell planking and materials used for construction are very important to evaluate sailing yacht for sale, that’s why an expert should value the yacht before buying or selling. We would be more than happy to help you get the right boat for the right price and help you own the best possible yacht to make your dreams come true. 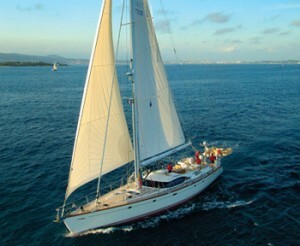 maintanence low cost operations in order to maintain a sound hull, a reliable mast and quality dacron sails. Second hand sailing yachts are always in demand due to large number of sailing yachts are in the market and they are considered to be most easily chartered by Bareboat charter companies which are similar to car rental companies who rent cars to anyone who has a valid driving licence such applies with bareboat sailing charters where anyone with a valid navigators licence and adequate insurance can hire these yachts, then just add some fuel and provisions to be able to sail away with their loved ones either friends or family. Meanwhile crewed sailing yachts are far more different than small grp yachts where the cabins are much bigger and comfortable compared to strict minimum comfort offered in small sailing yachts for sale. The professional yacht crew would be handling the sails and the maneouvres and take care of your well being during weekly or more charter period.